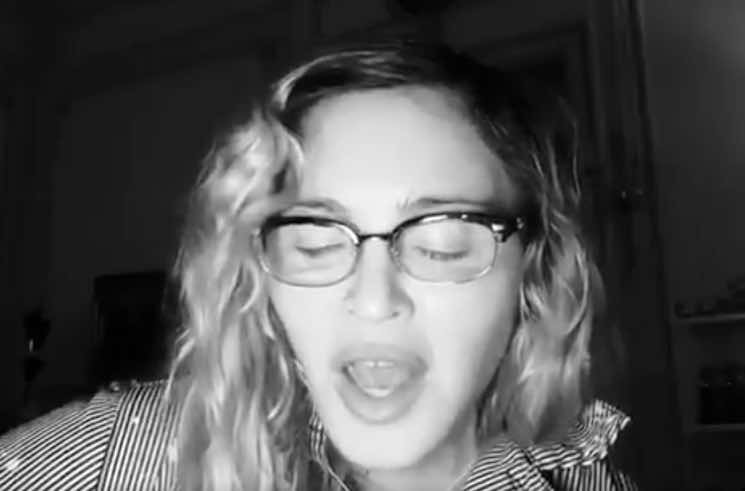 Madonna covered Elliott Smith's Either/Or classic "Between the Bars" back in 2013 as part of her SecretProjectRevolution launch, but now the pop diva has offered up a different variation on the tune. No longer dressed in all black, on her knees with one arm pinned behind her back, Madonna's new rendition is certainly less dramatic than the 2013 onstage version. Instead, she keeps it simple with just her voice and an acoustic guitar, captured in a black-and-white video she posted to Twitter at 4:35 a.m. this morning (November 9). Unfortunately, she explained the song was written by an "Eliot Smith." Check out Madge's latest take on "Between the Bars" below.